There is a range of landforms of erosion found along the coast. These are determined by geology, rates of erosion and beach profile. Headlands and bays most commonly form along discordant coastlines. Discordant coastlines form where geology alternates between bands of hard and soft rock (see image below). 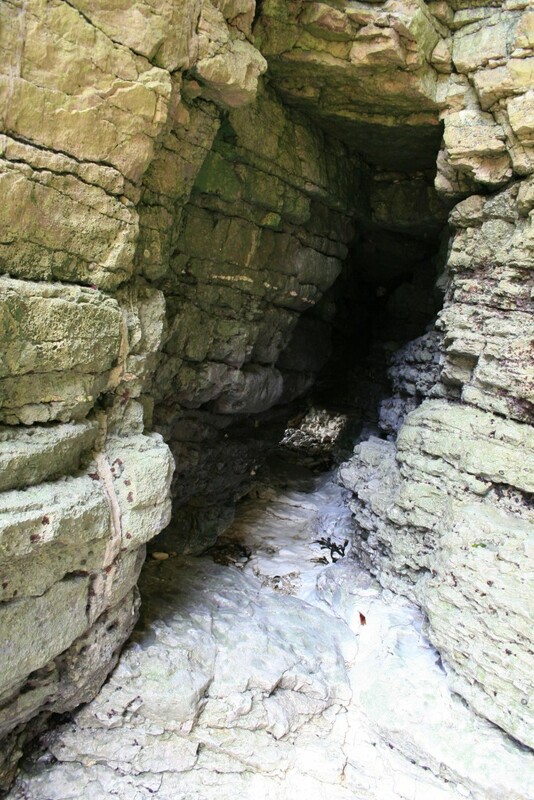 As soft rock, such as glacial till, is more susceptible to erosion it erodes more rapidly than more resistant rock such as chalk. This results in the formation of headlands and bays. Bays and headlands along a discordant coastline. Where the coasts has the same type of rock along its length fewer bays and headlands are formed as the rate of erosion tends to be similar. These types of coast are known as concordant coastlines. The outer hard rock (for example, granite) provides a protective barrier to erosion of the softer rocks (for example, clays) further inland. Sometimes the outer hard rock is punctured, allowing the sea to erode the softer rocks behind. This creates a cove, a circular area of water with a relatively narrow entrance from the sea. Cliffs are common features of coastal environments. Over time cliffs retreat due to a combination of sub-aerial weathering and coastal erosion. Wave action and weathering create a notch at the high water mark. An example of a wave-cut notch is shown in the video below. Over time the wave-cut notch will develop into a cave. Eventually, the weight of the unsupported cliff will cause it to collapse. As the cliff collapses a layer of flat rock is left behind called a wave cut platform. The platform typically has a slope of less than 4 degrees, which is often only fully exposed at low tide. Wave cut platforms have a significant impact on the ability of waves to erode the base of the cliff. This is because the waves have further to travel in very shallow water as the platform grows. Waves tend to break earlier before they can erode the base of the cliff. The wave cut platform at Selwicks Bay, Flamborough. 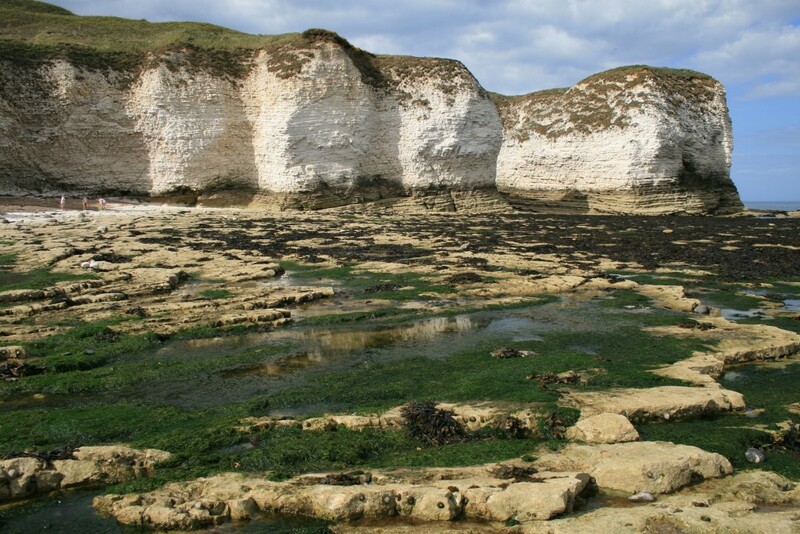 Sedimentary rock, such as the chalk cliffs located at Flamborough, Holderness Coast, are more resistant to erosion. They are typically made up of bedding planes (layers) with joints (vertical cracks). The image below shows this. Bedding planes and joints in the chalk cliffs at Flamborough. Cracks are regularly formed in more resistant rock that forms headlands. 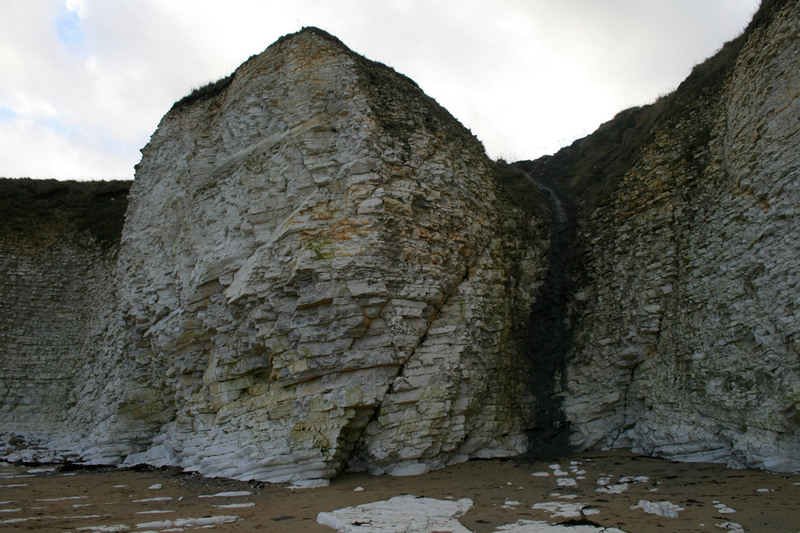 The image below shows cracks in the chalk cliffs at Flamborough, Holderness Coast. Over time the crack will erode further, as the result of erosional processes such as hydraulic action. 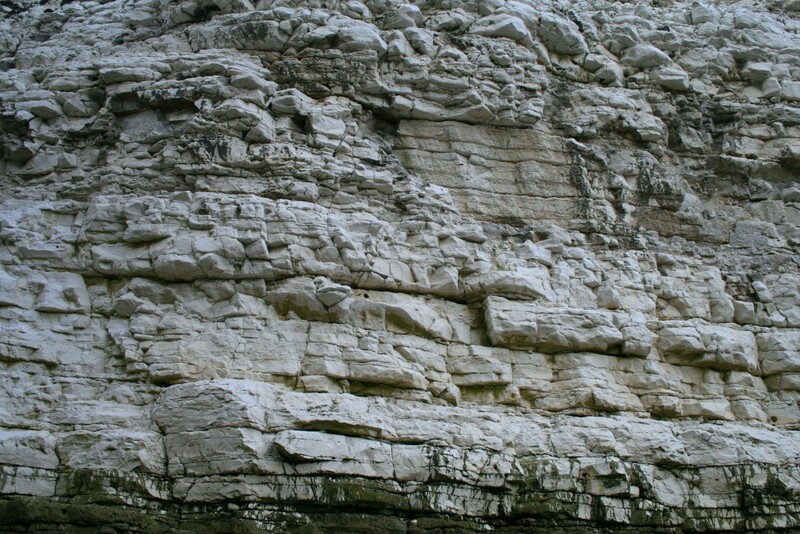 The video below shows chalk bedding planes (layers) with joints (vertical cracks) in the chalk cliffs at Flamborough. Notice the erosion taking place at the base of the cliff. Eventually, the crack will enlarge and become a cave. 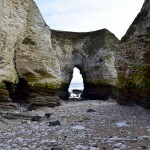 A cave at Selwicks Bay, Flamborough. Occasionally, wave action and weathering erodes joints in the cave roof to form a blow hole. Where the cave erodes through the headland an arch is formed (see image below). When the roof of the arch collapses a stack is formed (see image below). Where erosion excavates enough material along joint or bedding plane , a steep-sided inlet may be formed called a geo. 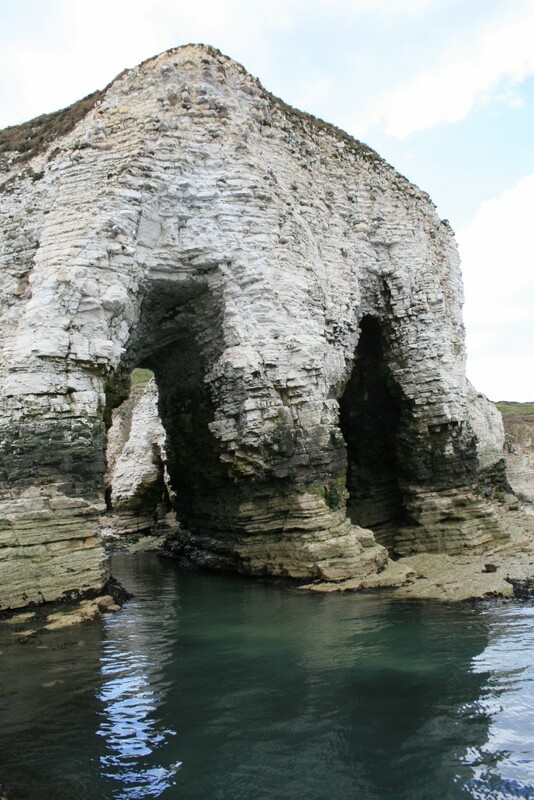 A geo formed behind an arch at Flamborough. 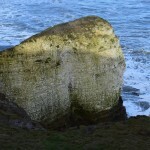 The video below shows a geo at North Landing, Flamborough. 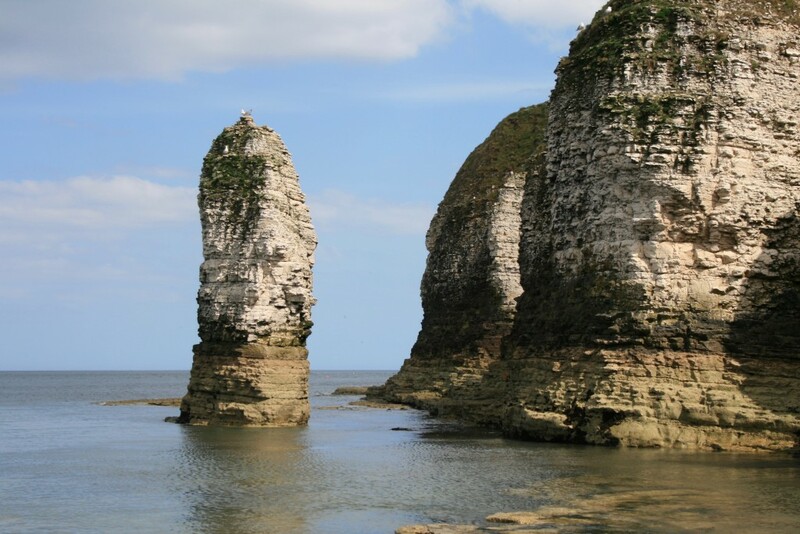 The video below shows a geo at Selwicks Bay, Flamborough. Find out about the process of longshore drift. Find out about depositional landforms.